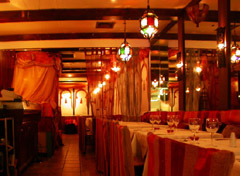 Visit Casablanca if you want a memorable eating and drinking experience. Relax and have a journey to the land of mystery and exotic flavours and sample the delights of North African cuisine, famous for being healthy and wholesome. This is a homely and informal restaurant, designed to resemble a traditional Moroccan eatery, complete with a private tent, cushions, lanterns and candle-lit tables. In the evening, the resident musician adds to the warmth of the ambience and cheer up the place with Arabic and Moroccan music. Hoards of loyal customers make sure this popular restaurant is buzzing at all times. On offer are mixed meze, mixed grills, couscous, kofta and a whole lot of other Moroccan specialities as well as Moroccan coffee or mint tea. This is a perfect party place with a private tent in the main restaurant, a function room in the lower floor, and easy access to Queensway and Bayswater underground stations. Now add live music, belly dancing and shisha for a mother of all parties. The waiting staff are friendly and ready to help you select from the well-laid menu. They can also accommodate any special or dietary request. The menu proposes a wide selection of Moroccan and Mediterranean cuisine priding itself with refined daily cooked Tagines and Couscous. Alongside the traditional cuisine, the menu includes elegant dinner specials bringing new flavours and combinations as the seasons rotate.